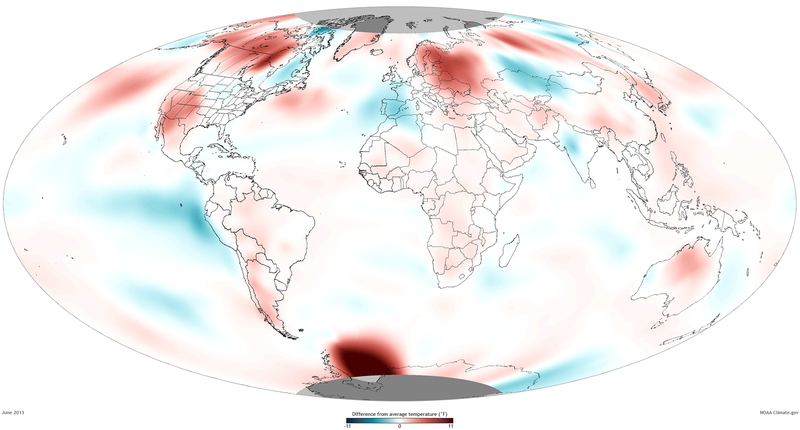 In June 2013, many areas of the world experienced higher-than-average monthly temperatures. According to the latest statistics from NOAA’s National Climatic Data Center, the globally averaged temperature for the month tied with 2006 as the fifth warmest June since record keeping began in 1880. It also marked the 37th consecutive June and 340th consecutive month—that’s a total of more than 28 years—with a global temperature above the 20th-century average. The last below-average June temperature was June 1976 and the last below-average temperature for any month was February 1985. The map above shows temperatures relative to average across the globe for June 2013. Shades of red indicate temperatures up to 11° Fahrenheit warmer than the 1981–2010 average and shades of blue indicate temperatures up to 11° Fahrenheit cooler than the average. As the red shaded regions demonstrate, north-central Canada, most of Alaska and the western United States, much of northern and eastern Europe, western Russia, part of northern Siberia, and north-central Australia all experienced above-average June temperatures. Meanwhile, northeastern Canada, much of western and southern Europe, central Asia, Far East Russia, and most of India were notably cooler than average. The June global land temperature was the third highest on record at 1.89° Fahrenheit above the 20th-century average. June was warmer than average across all of Japan, with temperatures ranging from 0.5° Fahrenheit to 2.5° Fahrenheit above the 1981–2010 average. Much of Croatia was also warmer than the nation’s 1961–1990 average June temperature. While the United Kingdom’s June temperature was 0.4° Fahrenheit below their long-term average for June, it was still their warmest June since 2010. For the ocean, the June global sea surface temperature was 0.86° Fahrenheit above the 20th-century average, the 10th warmest for June on record. Continuing a pattern that has persisted for more than a year, neither El Niño nor La Niña conditions were present across the central and eastern equatorial Pacific Ocean during June, with sea surface temperatures below average across the eastern half of the equatorial Pacific. According to NOAA's Climate Prediction Center, neutral conditions continue to be favored over the next few months. Caption by Susan Osborne and Jessica Blunden adapted from the June 2013 Global Climate Report from the National Climatic Data Center (NCDC). Maps by NOAA Climate.gov team, based on U.S. Climate Division data from NCDC. Reviewed by Jessica Blunden, National Climatic Data Center.